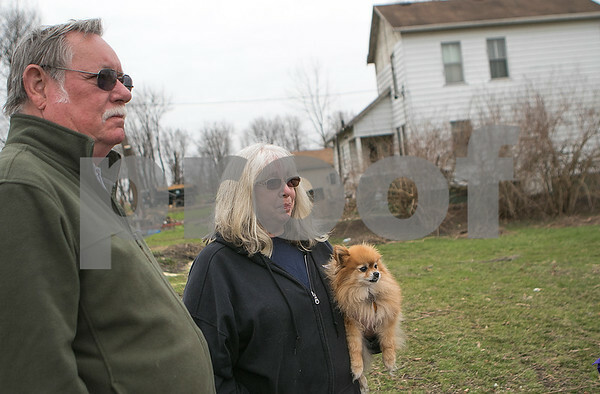 Fairdale residents Dewey Barnes and his wife Jean Barnes holding their dog Baby, watch as debris is cleared from the side of their yard on West St. in Fairdale on Thursday, April 17, 2015. The Barnes' house was about 100 yards away from their neighbors at 32362 West St. which was completely destroyed. Dewey has been a stormchaser in DeKalb County for over 35 years and called NOAA Thursday night to report the tornado touching down just outside of Fairdale.